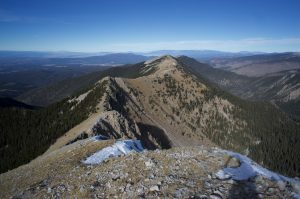 Northern New Mexico’s Truchas Peaks are the most rugged part of the southern Sangre de Cristo range, and the source of multiple streams and rivers, many followed by trails. With “summer” finally (hopefully) coming to an end down here, I decided to get in one more mountain outing before the snow. I have previously used the Rio Quemado to reach Middle and South Truchas, and the Rio Santa Barbara to reach the North. This time I paid my first visit to Rio de las Trampas to tag the surrounding satellite peaks, from Trampas around to Jicarilla. 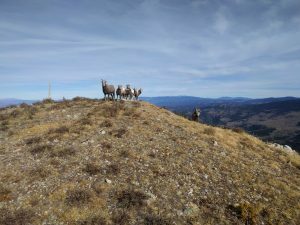 While most of my route was technically off-trail, the local bighorn sheep maintain a decent network of ridge trails in the region, so the only truly cross-country travel was getting on and off the ridge. The route is definitely best clockwise, so that the interesting scrambling is done going up. I left home a bit before 7:00, heading north through the tiny Spanish towns of Chimayo and Truchas before turning off onto the dirt road through the “town” of El Valle to the Trampas Lakes trailhead. It can be cold in these north-facing valleys, and the sun rises late, so I was in no hurry to start. Though temperatures were comfortable in the valley, probably around freezing, the partially-frozen stream and lakes told the true tale. I normally don’t carry navigational aids in familiar territory like the Pecos, but I was glad to have loaded topos onto my “new” phone as I left the trail to climb around 2000 feet to Trampas Peak. 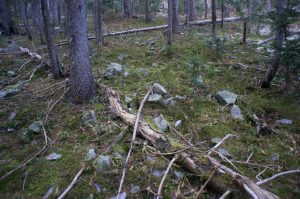 The deadfall looked wretched near the Trampas River, but was rarely a problem on my climb up a broad, indistinct ridge leading to Trampas’ summit. Treeline is high this far south, and at 12,170′, Trampas barely peeks out of the forest, so I had scant views for most of the climb. Emerging just below the summit, I found a large cairn with a stick, and a decent-sized herd of bighorns. At first, I only saw ten or so ewes and lambs, but then the alpha buck, and later an apparent beta, peered over the ridge to see what was happening. I wanted to touch the stick, but even when I approached within 10-20 yards, the sheep showed no inclination to move, despite my supposedly being an apex predator in the area. Coward that I am, I skirted the summit, then stood to watch as the alpha ram made half-hearted attempts to mount some of the ewes, and was roundly rebuffed. I was worried that the long, wooded ridge toward 12,453′ would be a deadfall nightmare, but after a bit of meandering in the woods, I found a sheep-trail right on the crest, with few obstacles and good views down into the Santa Barbara drainage. Emerging from the trees, I found myself on alpine tundra covering a quartzite uplift, with fins descending west into the Trampas valley. I found my only register of the day on the summit, with only the party who placed it and a familiar name “moving on borrowed time” having signed. I added my name, then started the day’s crux. 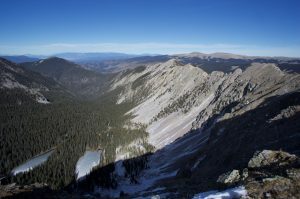 The jagged ridge between 12,453′ and 12,880′ seems to be traversed by sheep, despite featuring several seemingly-mandatory class 3 steps, and an optional class 4 one near the end. Fortunately, the rock is solid and blocky, and the sheep have put in a decent trail elsewhere. I followed one ram doing maintenance, who fortunately did not decide to stand his ground, but instead scooted ahead for a few hundred yards before ceding me the trail and dropping north into Santa Barbara. North Truchas is a short jaunt from 12,880′, and the scramble from 12,453′ all the way to Middle Truchas looked fun, but I had work to do elsewhere. 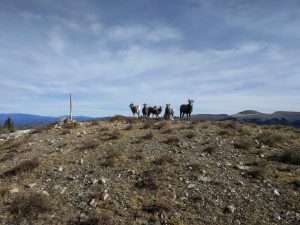 Yet another small flock of bighorns watched from a safe distance as I dropped north to a saddle, then made the long trail climb to Sheepshead. I took advantage of the peak’s surprising 4G coverage, then set out on the pleasant grassy stroll to Jicarilla. This part was almost all runnable, but my knee has been acting up a bit lately, so I hiked more than necessary. 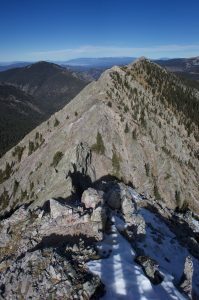 From my inspection of Jicarilla’s east face from the other side, it looked like an obvious avalanche chute just southeast of the summit would be the best descent line. The steep turf on the open slope worked until around 11,000′, where new saplings and a potential cliff band blocked the way. Fortunately the woods were fairly open, so I was able to quickly side-hill down pine duff to the creek. Lower down, I was surprised to find a moss carpet that would fit in better in the Cascades. 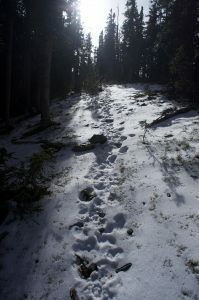 I quickly found the well-used trail, where the remaining snow had been beaten nearly to ice, then had a casual jog back to the car. Come down a little further south for supper and margaritas.